Around this holiday season, green is something that we’re constantly seeing. 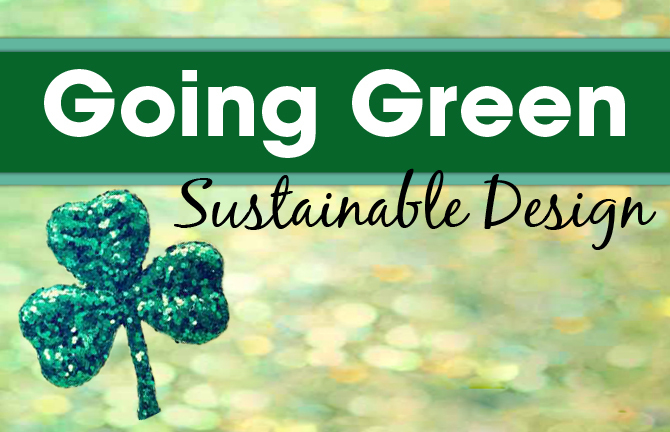 We wanted to take this to the next level and talk about green design! Going green has been a prominent factor in our everyday lives, and even as designers we have the ability to create a new way for consumers to experience products and help save the environment. The Earth needs us, and we need the Earth – so we need to treat each other right! So what should we think about when creating sustainable design? Think of the way the product will be used from beginning to end. Where will your product start out, and more importantly – where will your product end up? If designers and creators are able to approach packaging in a “life-span” way, it may help them see that something needs to be done. Also, take into account how much product will be going through the same “life-span” and try to see how it will impact the environment after the consumer is finished with it. Okay, we have a life cycle – now how can we make it longer? Especially when creating packaging, try to find ways to make that packaging reusable whether it is for that specific product or another one. How can you design something so it can be used more than once, or a few times tops? This will help cut down on waste, while still being able to utilize the product originally bought. Coca Cola teamed up with Ogilvy & Mather China on a new “2nd Lives” campaign and created 16 red screw-on caps that transform the otherwise-useless left-over plastic bottle into something creative, fun and usable. This environmentally friendly campaign launched in Vietnam, where 40,000 free caps will be given away when purchasing the iconic soda drink. You’ve used the container or bottle way more than once – now what? Go even further than re-usability and factor in recyclability. Not only can the consumer get multiple uses out of the product, but they are able to recycle it so it can be used for something else. As it stands now, reusability and recyclability don’t really go hand-in-hand because a lot of recyclable things aren’t strong enough for continued use. But there is great potential here! All the above is easier said than done – but the concepts are out there. Sustainable design may take more time and money, but ultimately, we’re going to have a longer time on this Earth to make that money and time back. Who is behind the future of sustainability? Packaging engineers! This career field ranges anywhere from design conceptualization to product placement. Packaging engineers must interact with research & development, manufacturing, marketing, graphic design, regulatory, purchasing, planning and more. Packaging engineers come in contact with a wide variety of people throughout the product’s creation, so they play a crucial role in the process. Going green may take a bit of extra work, but it’s completely worth it in the end! Market Research Methods: How to Choose the RIGHT One!